The JBL GO 2 is an ultra-compact speaker that’s waterproof and can really take a beating. While its small size limits its audio performance potential, it can get surprisingly loud and has a handy speakerphone that help make it one of the most well-rounded ultra-compact speakers on the market. When it comes to audio performance, it’s usually the case that larger speakers sound better simply because they have more room to pack in better drivers that can move more air. It’s just physics. That said, however, there are speakers that punch way above what their size suggests - the JBL GO 2 is one of those speakers. The JBL GO measures just 71.2 x 86.0 x 31.6 (mm) but it gets surprisingly loud. Considering its size, audio performance is good ... even if the bass response can't keep up with the clean-sounding mids and highs. Its 5-hour battery life leaves something to be desired but, for $40 (£30, AU$50), this IPX7 waterproof speaker is a steal for those who need portability above all else. The JBL GO 2 doesn’t feature the typical cloth exterior of other waterproof speakers. Instead, it sports a rubberized housing that feels durable. If you're afraid of looking like everyone else at the beach with a generic black box, the GO 2 comes in a staggering 12 colors so you can pick one that best represents your tastes. 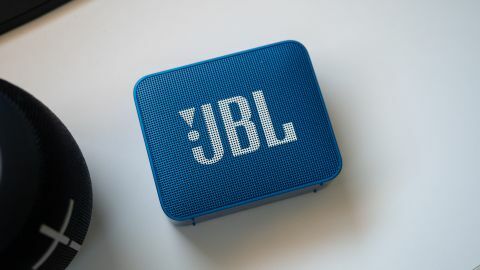 On front of the speaker is a large JBL logo and a grille that allows the sound to project outward. There is no back grille for passive bass radiators, like you might find on a speaker like the Sony SRS-XB41, but that's expected for a speaker of this size. All of the controls are located on top of the speaker. You have buttons for power, pairing, volume, and a multi-function button. The latter works as playback controls and a long-press activates your phone’s voice assistant. This also means there’s a speakerphone, which allows you to control your voice assistant or take calls on. However, the speakerphone isn’t particularly sensitive and you’ll have to speak up. On the right of the speaker is a rubber door that hides the microUSB charging port and 3.5mm aux jack for legacy devices. Don't let its diminutive stature fool you, the JBL GO 2 can really crank the tunes. We found that 50% volume is comfortable for listening to music and pushing it to over 75% really offers a surprisingly full sound for such a small speaker. That said, you should be careful going overboard as the sound gets noticeably harsh near max volume: At max volume, music is very harsh and fatiguing. While bass is basically non-existent, mids and highs sound tight and smooth. The sound is quite narrow, which is expected from a mono speaker but other Bluetooth speakers do a better job of projecting music outward. Plus, the JBL GO 2 only fires sound forward which means if you sound to radiate evenly around the pool deck, you’ll want to get a 360-degree speaker like the UE Boom 2. In terms of battery life, you’ll get around 5 hours listening at around 50%. If you crank it higher, expect closer to 4, which is quite short in comparison to other portable speakers, but that’s the trade off JBL made by choosing such a small form factor for the GO 2. The JBL GO 2 (left) and the Minirig Mini (right). If you want the smallest portable Bluetooth speaker, the JBL GO 2 is a contender, especially for the price. It's hamstrung by its physical size limits, sonic abilities and battery life but we were still impressed with how loud the speaker got. In terms of competition, the Minirig Mini nearly matches the GO 2 in size and sounds multitudes better thanks to its aptX support and better driver. However, the Mini isn’t waterproof and requires a proprietary charging cable. The JBL GO 2’s closest competitor comes from within the family in the form of the JBL Clip 2. The Clip 2 is also waterproof and features a handy clip for travel and using outdoors. However, the Clip 2 costs twice as much and, in our opinion, we think the GO 2 is a better value. If you want bass and can compromise in size, the JBL Flip 4 is an excellent choice that will check all the boxes on your list.